Confession #1: I have a lot of books. Confession #3: I keep my most treasured books behind closed doors. 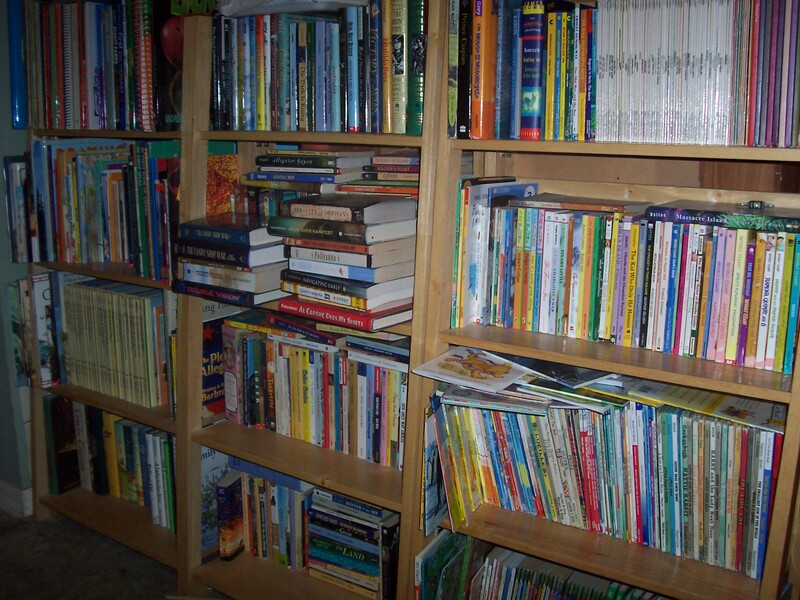 I first started hiding my books after my eldest child started to “wear out” his own books. Lift-the-flap books with no flaps to lift. Using books as bridges, literally walking on them across the floor, was a favorite activity. And with his books, spines were optional. I feared for my beloved books, as well as my husband’s collection. Our favorite books went from the top shelves—he could scale the bookshelves—to high levels inside cabinets. I could hear the cabinet doors opening, but I didn’t always hear him at the bookcases until it was too late. In the past three years that I’ve been homeschooling, the book population has hit overdrive. The main wall of books–about a third of what we have. The non-fiction area has doubled and the sum of the middle grade novels that my oldest son reads every night is greater than anything I ever held as the lone reader of them. My youngest has a two shelf bookcase of picture books and all things pink while the middle child hoards The Magic Tree House and military history. Last year I wrote a post about my oldest turning into a reader and he hasn’t slowed down. The other night, when he came looking for another book amid the post holiday explosion, I realized he hasn’t read Bridge to Terabithia or A Wrinkle in Time. All of the Katherine Paterson, Madeleine L’Engle, Laurie Halse Anderson, Terry Brooks, and Orson Scott Card books are behind closed doors. Not to mention Narnia, Green Gables, Hogwarts, and The Shire. So, my goal this month—hopefully this week—is to get these books out and into circulation among my household. No more restricted section in the family library. I’ll document this effort with photos, so stayed tuned! This entry was posted in ASD Autism Spectrum Disorders, autism, banned books, books, children, family, homeschooling, Katherine Paterson, L'Engle, Laurie Halse Anderson, library, LIFE, literature, middle grade, motherhood, Nerdy Book Club, nonfiction, novels, parenting, pictures, READING, Terabithia, Terry Brooks by Carrie Dalby. Bookmark the permalink. I have a lot of books myself, most of which are in storage because I have no room for them. I have books piling up in here, cluttering up my small apartment. I recently started putting books on my iPad, although its not the same as having the real thing. I’m a huge proponent of reading, and am very glad to see you have a house full of readers.